World's largest steel company ArcelorMittal on Thursday reported a net loss of $728 million for the first quarter ended March 31 on account of currency headwinds as well as declining iron ore prices. The company, controlled by NRI billionaire Lakshmi Mittal, had reported a net loss of $205 million in the year-ago period, it said in a statement. Net sales of the steel major fell by 13.5 per cent to $17.12 billion during January-March from $19.79 billion in the same quarter last fiscal, it added. 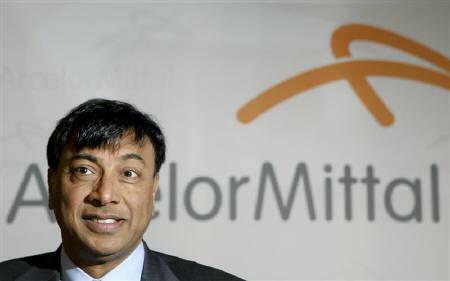 ArcelorMittal Chairman and CEO Lakshmi Mittal said: "We faced a number of headwinds, including a declining iron-ore price, stronger dollar and surge of imports in the US." As a result of which, earnings before interest, taxes, depreciation, and amortisation (EBITDA) declined to $1.4 billion, although the underlying performance of the firm’s steel business remained similar to the first quarter of 2014. The performance in Europe was of particular note, with EBITDA improving 15 per cent year-on-year, he added. The company is responsible for around 6 per cent of global steel output. "We are focused on achieving a 15 per cent reduction in mining costs and improving the competitive position of our US operations," Mittal said. On outlook, ArcelorMittal said: "Due to foreign exchange movements as well as the postponement of some investment projects the company has further reduced the FY15 capital expenditure budget to about $ 3 billion." ArcelorMittal continues to expect positive free cash flow in 2015 and to achieve the medium-term net debt target of $15 billion. The company expects net interest expense of around $1.4 billion in 2015, it added. For the first quarter, ArcelorMittal reported an EBITDA of $1.4 billion (including $ 0.1 billion onerous contract provision). Steel shipments stood at 21.6 million tonnes (MT), an increase of 3 per cent compared with 21 MT in Q1 2014. Iron ore production rose by 5 per cent to 15.6 MT in March quarter from 14.8 MT in 2014 and of this 9.4 MT was shipped and reported at market prices compared with 9.3 MT last year. ArcelorMittal’s net debt stood at $16.6 billion as of March 31 compared with $18.5 billion in 2014.